BitTorrent is used by millions of people every day, even in places where you wouldn’t really expect. New data suggests that employees at the European Parliament are particularly interested in downloading pirated movies and TV-shows at work. They are in good company though, as pirates can also be found at the U.S. House of Representatives, Hollywood Studios and even the Vatican. Most TorrentFreak readers know that when you use BitTorrent without a VPN, the whole world is able to see what you’re downloading and where from. Dozens of companies collect data on alleged BitTorrent users, either for analytics purposes or for future legal action. With help from BitTorrent tracking outfit ScanEye we have been keeping an eye on interesting “pirate” venues over the years, and it’s become a holiday tradition to share some of our findings. This year we put the spotlight on the European Parliament, where several MEPs are proposing to decriminalize file-sharing for personal use. When we look at the prevalence of piracy in Brussels, it’s safe to say that this plan is partly in the interests of the lawmakers themselves. Below is a sample taken from dozens of recent “hits” of European Parliament IP-addresses on various BitTorrent trackers. The pirated downloads include newer movies such as Elysium, classic films such as The Ten Commandments and TV-shows including Breaking Bad. Of course, the European Parliament is not the only political arena where people pirate files. The same is true at the U.S. House of Representatives, although we saw much fewer hits than the year before. The decrease in activity may be due to the fact that the House has implemented a rather strict anti-P2P policy. This resulted in a Spotify-block, much to the annoyance of the RIAA who saw it as overbroad censorship. Outside of the political sphere there is also plenty of piracy, and the offices of movie studios and record labels are no exception. Again, there appears to be a downward trend in most of these places, perhaps in part due to our previous coverage. However, there are still plenty of interesting “hits” left such as the following titles which are linked to IP-addresses operated by Paramount Pictures. When it comes to online piracy no place appears to be without sin. 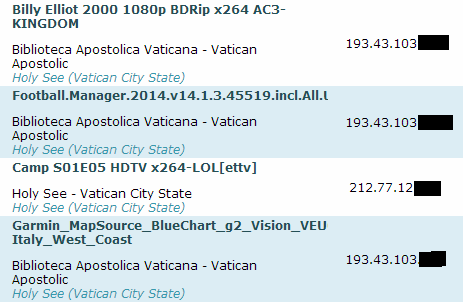 Earlier this year we highlighted that there are also plenty of BitTorrent pirates at the Vatican, and the new pope didn’t do much to change this. Below are the most recent hits from Holy See, in the Vatican City State, which are a mix of video entertainment and software. The above is just the tip of the iceberg, as we could list many more unexpected locations where people pirate movies, software and TV-shows. As with most BitTorrent tracking software there is a chance that some results may be spoofed, but this is rare. If we have to learn something from this exercise, then it’s that there are BitTorrent pirates in all decent sized companies and institutions. But that shouldn’t really be much of a surprise to most people by now.